For all those people who say they aren't cat people, but deep down know they are. Helen Brown wasn't a cat person, but her nine-year-old son Sam was. So when Sam heard someone mention that her cat had just had a litter, he pleaded to go and see them. Helen was powerless to resist and the deal was done - to be delivered when the kitten was big enough to leave her mother. Tragically, just a week later, Sam was killed in a road accident. Not long after this, a little black kitten was delivered to the family's doorstep. Totally numbed by Sam's death, Helen had completely forgotten about the new arrival, which belonged in another universe when Sam was still alive. Helen was ready to send her back, but Sam's younger brother, Rob, identified with the kitten who'd also lost her brothers. Stroking her, it was the first time Helen had seen him smile since Sam's death. There was no choice, the kitten - dubbed Cleo - had to stay. 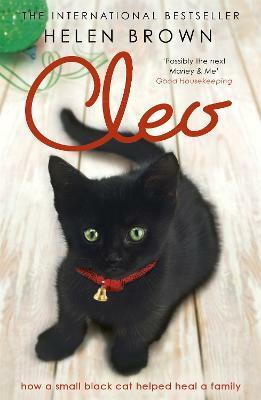 Cleo's immense character slowly taught the family to laugh again, giving them hope of getting back to normal. Over the next 24 years she went on to become the high priestess of Helen's household - vetoing her new men, terrifying visiting dogs and playing an integral role in their lives to become both a guardian and beloved friend. Helen Brown was born and brought up in New Zealand where she worked as a journalist, TV presenter and scriptwriter. Now living in Melbourne, Australia with her family, Helen continues to write columns for the New Zealand media, where she`s been voted Columnist of the Year several times.